Tim is the owner of a discrete manufacturing company in the Midwest. From the start, his business has been centered around creating specialty drilling and extracting parts for the shale industry. However, in the last 5 years, the work has expanded from one-off jobs to a more repetitive business model. Now, with two main products Tim’s company produces, there are three big challenges that keep him up at night. If any of these challenges in bold below ring true for you and your business, you may be happy to learn of one thing that could resolve all the problems. Right now, controlling Tim’s supply chain is a multi-person, multi-department, multi-database job. Supply chain management, meaning the way in which you control the process of raw parts flowing through your inventory into production of the finished good and getting that product from its origin to the consumption point, is a crucial part of any discrete manufacturer’s business. Tim’s team struggles with balancing the flow of that information and how it is controlled and spread across to the supplier, wholesaler, retailer and their customers. He has to find a way to reduce order sizes and lead times, all while integrating a better way to track pricing and produce more accurate estimates. Because 40% of Tim’s jobs are custom work and the remaining 60% is producing the company’s two product lines, accurate scheduling is paramount. His team currently spends hours reconciling employee schedules using an Excel spreadsheet and they do the same with their machine scheduling. When a project or part changes in a job, it usually means Tim’s costs go up, his estimates are no longer valid and the problem ripples through his business like a giant domino chip. Without a way to automatically adjust and be more flexible when it comes to the production schedule, Tim’s company is continuously falling short of his client’s delivery dates and is seeing a decline in new customer sales. One of Tim’s biggest concerns is how much lost or “mystery” time there seems to be from when a job comes in to when it is being shipped out. Tim’s team is operating with a small management system that was custom built for them about 10 years ago. While it’s done its job in the past, Tim is worried his company has outgrown it and fears he’s not seeing the whole picture of what’s really happening with each job. He currently has an EDI system in place for getting sales orders for his repetitive jobs but even with that technology, Tim loses time with some manual processes that take place after they get the orders. He knows he needs to consolidate information so that he can maximize efficiencies through one database and get the timely info his team needs. So what, you may be asking, is the one thing that could resolve all three of these challenges? It could be Enterprise Resource Planning (ERP) software. Planning and documenting every step of Tim’s manufacturing processes is the essential point to solving this problem. From tracking best practices, to accurate cost estimating, to efficient inventory control and reducing demand variables, ERP software will manage it all. Tim will have complete transparency into his supplier’s systems as well as his own, so he has ultimate control and knowledge over everything that comes in and out of his shop. Reduction in order sizes, lead times and knowing the workload of each worker and machine are among just a few things that will be a couple clicks away. With the right ERP solution in place, finished goods are ready on time and out the door for prompt delivery to the customer. Resolving scheduling problems is just what an ERP’s flexible schedule module will do for Tim and his staff. Being able to pull real-time data allowing Tim’s team to adjust for unplanned events and changes while still ensuring optimal performance across the company would no longer be wishful thinking. And if the ERP had a scheduling advisor feature, Anthony, Tim’s machine scheduler, can instantly see the status of all 10 machines and know exactly when to put the scheduled jobs on each machine. With that kind of comprehensive knowledge, Tim’s jobs would start on time, run efficient and smoothly and most importantly for new business, be delivered on time and on budget. Tim knew his team spent too much time in the weeds, rather than in action. The more real-time data he has, the better his team can plan for future jobs, which means delivering on time with greater profits for his company. With the right ERP software, Tim’s EDI system could seamlessly integrate and allow them to receive sales orders and quickly build out all the parts and pieces of the job — with no manual actions needed! 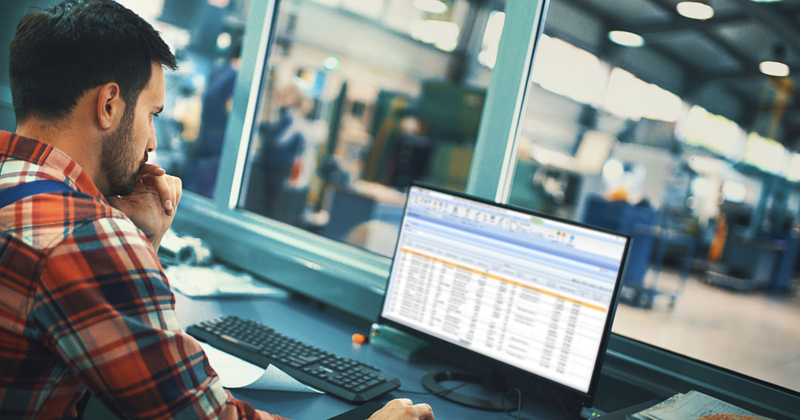 Because an ERP provides such robust real-time information on the smallest bolt and tracks it all the way from purchase to its inclusion in the client’s final delivered product, Tim will know exactly where his shop needs improvements and which jobs to schedule next.